Double your pleasure, double your fun, double your Bentleys because Nice Price or Crack Pipe bets you can't buy just one. A biblical 93% of you invoked your Crack Pipe shaman to curse yesterday's Mystery Datsun. Today we have a pair of English twins that thankfully aren't the result of royal inbreeding. Hal Riney was the rebel ad man who made San Francisco a creative center for advertising. He wrote the Crocker Bank jingle; We've only just begun, which then became a monster hit single for the Carpenters. He made wine coolers something that not just girls drank with his homey and faux-scincere Bartles and James ads. Riney also helped get Ronald Reagan re-elected by intoning it's morning in America; made Saturn a different kind of car company - a different kind of car; and turned Wrigley Gum into something that doubled your pleasure. 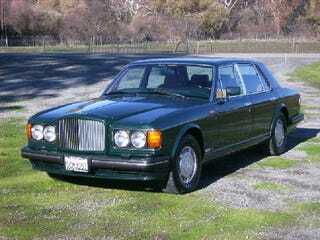 Also double the pleasure are Riney's two Bentley Turbo R sedans- a jet black '89, and a BRG '93. Why two Bentley Turbo Rs? Who knows, but the iconoclastic ad man sure must have loved the big, executive-class locomotives. Each is powered by a 6.75 litre OHV V8 of adequate power, which in non-Bentley speak equates to about 300 bhp, although that's only ever been estimated. Backing that up was the ubiquitous TH400 3-speed. When both Riney's career and his life ended last year, he left a long legacy, as well as these two cars which together total an elephantine 10,570 lbs! Part of that weight comes from the 30-odd head of cattle that gifted each car with the rich Connolly hides that cover every square inch of the interior not swathed in walnut burl. Part comes from the temperamental, smoke-containing electrical system that has become the bane of many an owner. Most of the weight, however, comes from the hand-lain, and heavily leaded body. The Black '89 must have been favored, as it turned 93,000 miles under its blackwalls, while the later, and greener, car has only made it to 55k. Regardless, both cars appear as-new, and are claimed to have been meticulously maintained by British Motors in San Francisco for much of their lives. So what do you say to a pair of Bentleys that have lived the good life? An '89 for $15,950, and a '93 for $29,950 or maybe you could cut a deal, and get both for a song- and that song may just be- We've only just begun. . .
San Francisco Craigslist - 1989, or go here OR Same Place -1993, or over here, should the ads disappear. Hat tip to Eggwich!